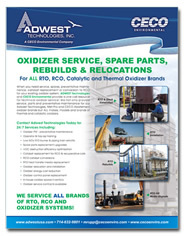 Adwest Technologies, Inc. and CECO Environmental have expanded our RTO, RCO and thermal oxidizer service and rebuild capabilities to include ALL oxidizer brands! Please contact Mark Salamone in our Anaheim, CA headquarters at 714-632-9801 x108 or msalamone@onececo.com to obtain a cost free proposal on how we can upgrade your RTO for greater energy and VOC destruction efficiency! download our new RTO Oxidizer Rebuild and Service Brochure! Adwest Technologies, Inc, founded in 1988, is a leader in the design and manufacturing of RTO Oxidizers offering 95-97% thermal efficiency and “flameless” operation using NGI-Natural Gas Injection, eliminating the emissions of environmentally harmful NOx . Adwest has provided more than 800 RTOs worldwide for flow rates from 1,000 scfm to 80,000 scfm. Specialized RETOX RTO designs with acid gas scrubber packages are also available to treat VOC streams with halogenated compounds. Brian Cannon, Vice President in Adwest’s East Coast Office in Wellsville, NY : bcannon@onececo.com 716-474-9462.